Is QuickOption reliable? Find out the truth in honest QuickOption Review! Being unique and original is usually a good thing, but sometimes this can be a negative characteristic in a world where safety and security are of the utmost importance. For instance, QuickOption binary broker is a company with specific features, and this broker is unique since it offers only mobile trading. In other words, clients can only trade with QuickOption once they download their mobile app, and this method is something that “traditional” binary brokers typically do not endorse. Of course, they offer mobile apps, but their primary trading terminal is a desktop version. If you continue reading our QuickOption review, you can see for yourself how efficient is this revolutionary approach to binary trading. As QuickOption review spotted, this broker is owned by Rodeler LTD, a corporation located in Limassol, Cyprus, QuickOption is a broker house that offers binary trading services. However, this company is still very young, and experience also plays a significant role in this highly exciting and risky financial sector. No one wants to invest their funds into an enterprise that does not have enough knowledge and capabilities, and that is why long-lasting history and spotless reputation are imperative. QuickOption was established in 2015, but they already managed to obtain a license from CySEC. Their license number is 207/13, and this compliance with MiFID regulations is a big thing in the world of binary options. By reading our QuickOption reviews, you could see that this binary broker is focusing on a modern and futuristic approach to trading. However, the accounts that they offer are pretty ordinary, and in this respect – QuickOption is similar to all other broker companies in the market. Clients can choose between several types of accounts, and depending on the deposit – Silver, Gold, Platinum, and VIP account are available. The minimum amount for opening an account is $250, and the smallest amount needed for placing a trade is $25. For the high rollers, the maximum amount per trade is set at $60.000, but due to fears of QuickOption scam – we do not recommend such investments. When it comes to the actual trading process, QuickOption offers around 70 assets, and there is also a 100% welcome bonus. As we all know, these “gifts” are not always as generous as they may seem at first, and complicated terms and conditions are typically a part of these bonuses. Clients who are having suspicions about a possible QuickOption scam should pay a lot of attention to the fine print, and “generous” rewards and unrealistic promises are usually a clear sign of fraudulent and malicious operations. However, QuickOption does provide its traders with trading signals, and various analytical tools, such as dynamic graphs and multiple trading screens. Experts have conflicting opinions about the QuickOption trading platform, and the lack of desktop version has been under considerable criticism. QuickOption is an exclusively mobile broker house, which means that their clients need to download a free app to their phone – and they are ready to dive into the exciting world of binary options. This innovative solution promises automated trading process, but it remains to be seen if QuickOption can stand the test of time. Luckily, SSL encryption seems to be incorporated into the platform, and this offers at least some level of security when trading with this binary broker. Depositing money into a young and unverified broker can be a risky activity, and that is why we encourage our readers to perform the necessary research and check everything before investing with a particular company. QuickOption broker offers various options when it comes to making deposits and withdrawals. It usually takes abut 3-5 business days to transfer the money to and from your bank account, and most users are choosing e-wallets and credit cards as their preferred banking methods. Also, standards wire transfers are offered as well, and clients can select the option that best suits their needs and preferences. 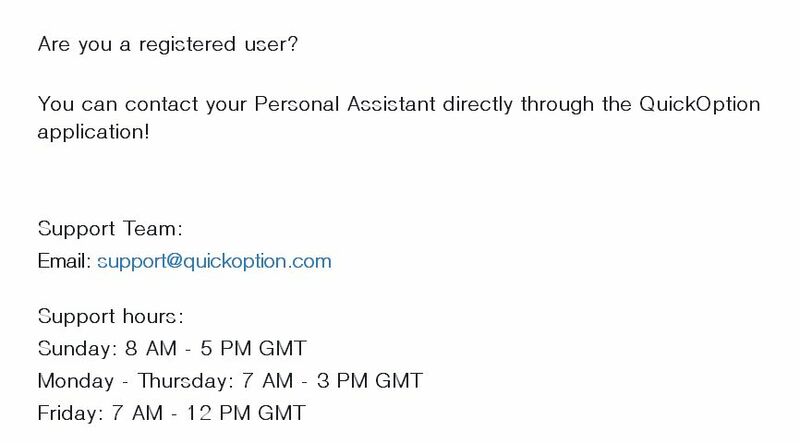 Only English language is offered in the customer support section on QuickOption trading app, and this is a major drawback when it comes to providing users with a global binary portal. Even though QuickOption is offering personal assistants to traders who create particular trading accounts, QuickOption review recons that the lack of other languages seems strange and not professional at all. The support teams are available 24/7. It is evident that this broker house is offering something new and something different, but their futuristic ideas and advanced solutions are still in their “working phase,” and it takes some time to create a perfect trading environment. That is why trading with QuickOption can be a risky and unpredictable adventure, which is not something you want when it comes to your hard-earned money.